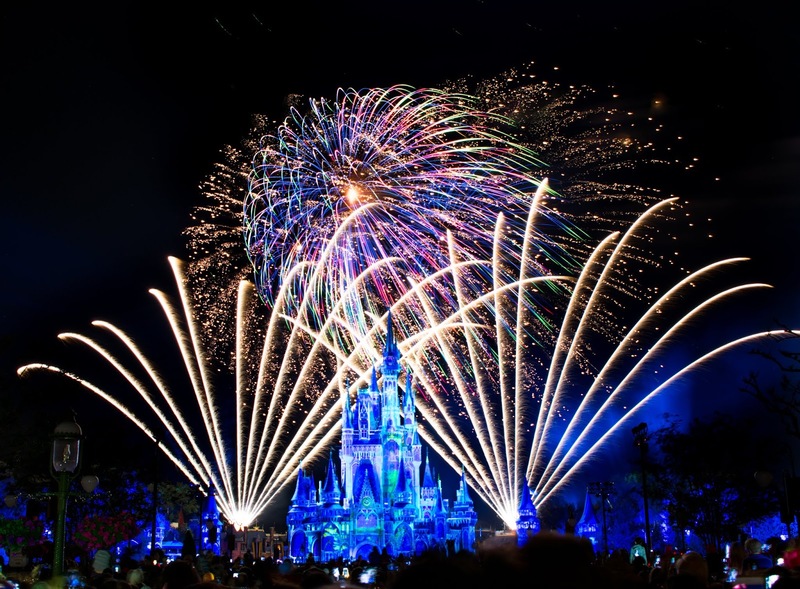 With Happily Ever After recently passing the one year mark entertaining guests on a near nightly basis, we're looking back at a few of our top viewing locations for this show and why we chose those particular locations. Some of these choices will be rather straight forward but at the same time a select few of these may be locations you've never even thought about watching the show from. Happily Ever After is unique for a few reasons. First and foremost, this Magic Kingdom spectacular features projections and truthfully it relies heavily on them as the show progresses. Second, this show is very brightly colored compared to past fireworks spectaculars. Personally, I see the colors as a huge strongpoint for this experience. For example, just look at the array of colors in the photo below. Prepare yourself for a little amateur photography jargon. The photo itself is a long exposure of about the last 10-15 seconds of the performance. For non-photo people that's essentially like taking a video of the last 10-15 seconds of the show and compressing it all into one photo... hopefully that makes sense? Either way, it's kind of beside the point because what I hope to show with this image is just how colorful these burst can be. It's unique from about every other show I've personally seen at Disney or even elsewhere. 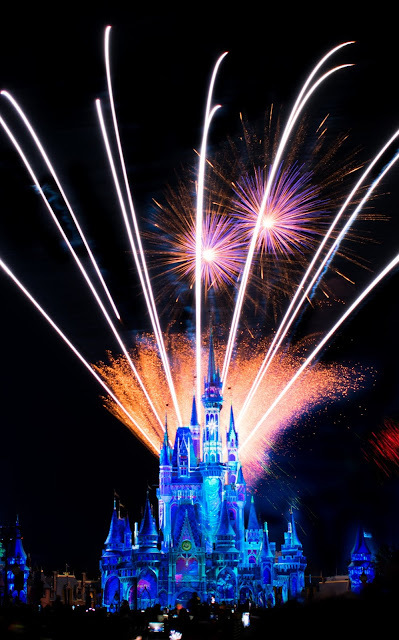 As for the first point mentioned of the projections, if you really and truly want to get the full Happily Ever After experience, you'll want to have a view of the majority of the castle wherever you're standing for the show. If you're not too concerned about all the projection details, or you've seen the show many times, there are quite a few options for places where you can get partial views of the projections but incredibly enjoyable and unique views of the fireworks without facing the crowds of Main Street quite as much. Last but certainly not least before we start listing locations, it's worth mentioning that right now (early summer of 2018), Happily Ever After crowds are incredibly high before the show. I'm not talking old wishes-esque crowds where it was tough to get a spot around the partners statue. I'm talking, there will be a sea of people most nights shoulder to shoulder from the front of the castle all the way back to Casey's corner and beyond. If you want a prime spot, get there early and right now for relatively peak crowds 45 minutes to an hour before showtime is likely what it will take for a fairly "prime" spot. If you want that "perfect" spot (in regards to guest demand), right behind the partners statue, be prepared to get there very very early and stand your ground. People can get aggressive so be patient and it'll work out. I'm typically not a person to wait around too terribly long for fireworks unless there's some special occasion, simply because I find it's not the best use of my time in the park. If you're careful and a touch patient you can find a good spot 20 minutes or so before the show and can use the other time you would have spent staking out your spot enjoying an ice-cream at the parlor or even shopping for a while on Main Street. So, while that's not entirely a comprehensive series of tips for this show, they're some things you may want to consider before picking out a spot from our list. Also worth mentioning is that this is not an end all be all list. There are so many different spots to view this show that its all in what you want to get out of the experience. The Happily Ever After Viewing "Zones"
As we start to get into some specific spots in detail, here's essentially the breakdown of the viewing areas of the show... at least in the way I see them. As always, the thoughts shared about these specific locations are simply my own opinion and yours could certainly differ. Either way, hopefully this gives you a closer look at what to expect from different areas of the park! The goal is that a few of our favorites of the group stand out or at least give you a few ideas for your next trip to Magic Kingdom. Truth be told, I see this as one of the very worst fireworks viewing locations for a couple reasons. If you're right up by the stage of the castle two things are going to happen. First, you're going to wait forever to keep your spot. Second, as the show starts you're going to be looking straight up at the castle. 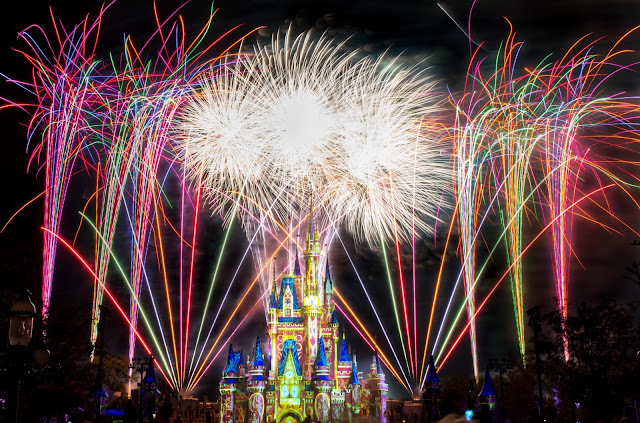 For the projections that isn't all that bad but at the same time it isn't even close to an ideal viewing spot for the fireworks being launched from the rear launch site, because as counter productive as it sounds the castle will be in your way. As arguably the best view of Happily Ever After, staking out a spot right behind or even near the partners statue is incredibly difficult to do. You'll be competing with not only guests but likely a few photographers as well who are looking for that perfect shot of the castle. With that mentioned, if you're patient and willing to wait, this is an incredible spot for this particular show. For the older wishes show it wasn't all that great simply because there was very little castle involvement with the performance itself. Happily Ever After is the complete opposite. The castle and castle projections are a huge part of the experience and this spot really does blend the "best of both worlds." If you've been to Walt Dinsey World in the last few years, you're likely aware that the hub grass itself has become incredible viewing locations for fireworks right past the outdoor seating area of Casey's as you walk towards the castle on each side of the street. However, the area is almost always used for special parties, dessert parties, or as a fastpass+ viewing area. There are a few exceptions and one big exception is Very Merry Christmas Parties. If you are planning a trip including an official party event be aware that there are typically no blocked off areas for those events and as a result this spot can make for an incredible viewing area. For example, during our 2016 trip to the parks for the Christmas season we were not only able to grab a spot before show time, but we also got to sit back and relax in the hub grass throughout the entire show. Truthfully, that is unheard of. We soaked up every minute of it and it was the perfect spot for the show. Not a single guest stood up and everyone just seemed happy to enjoy the show from a seated position. Obviously that's not the norm and may be a once in a lifetime experience, but it's worth noting that this viewing area is open to everyone during special parties and very few take full advantage of it. The hubgrass area itself is almost always taken, as mentioned, but on a typical day the area of Main Street in between the two grassy spots is open to anyone and can be a great spot because it is a touch higher due to a natural "peak" to the street before it falls just a touch as you move towards the partners statue. I know that sounds crazy, but there is in fact a little ridge as you move towards the castle on your way down main street. It's hardly noticeable in person but if you google some empty parks pictures you can see the rise in the pavement. It's a bit of a hidden gem spot and one that tends to fill up a bit later on. This spot offers a fairly good view of the projections and a great view of the fireworks high above you without facing some of the daunting crowds around the Partners statue. Here's the thing about Main Street. Personally, I love to watch from here. If you have even remotely good eyesight you can still see the projections (as long as you're not way down by the train station) and you're the perfect distance to catch the near ideal framing of the fireworks over Cinderella's Castle. The main thing about Main Street is that you want your spot to fall between the Plaza Ice Cream Parlor and the Main Street Bakery (now better known as Starbucks... but don't get me started on that one lol). If you get farther down the street towards the exits you're going to face a couple of things. First, the buildings are going to infringe upon your view just slightly but more importantly the farther from the castle you get the smaller the projections appear. If you stay in that "sweet spot" I mentioned, you'll get two major benefits. First, the crowds are lighter as everyone is starting to pick up on the "closer being better" philosophy for Happily Ever After. Second, the views are still pretty awesome. If you like the look of the photos in this article, every single one of them were taken from this exact spot which I managed to find 20 minutes before the show. It does fill in the last 10-15 minutes or so before the performance in the sky but this is a pretty ideal last minute spot. This is perhaps the most iconic viewing location on all of Main Street and it does fill up quite quickly. But... here's the thing. Happily Ever After is not a great show to view from the iconic second story of the train station. Sure, it's super nostalgic and the view of Main Street is truly second to none, but at the same time the projections are hardly recognizable at that distance and 99% of the year there's a flag pole tight in the middle of your view. If it was my personal trip and viewing opportunity I'd pick another spot unless its simply tradition for you and your family. This one seems a bit odd, but give it a chance if you've seen the show at least one time before from in front of the castle. The view from behind the castle is incredibly unique. You have the fireworks near the castle bursting up front, but at the same time you can catch the larger bursts from the rear launch site peaking over the top of New Fantasyland behind you if you're facing the back of the castle. In my opinion the ideal spot back here is near the front of Seven Dwarfs Mine Train and Enchanted Tales With Belle between the castle shaped entrance to New Fantasyland. When you stand here, or even over a bit closer to Pinocchio Village Haus, the experience is far different than anywhere else in the park. The sounds are second to none and echoing bursts leaving the buildings on each side of the castle is quite the sensory experience. If you're lucky enough to secure a seat in the outdoor area of Pinocchio's, you're definitely in for a treat and a dinner with a show! As you can see, there are a ton of great locations for fireworks viewing and no one option is going to fit all preferences. Much like other aspects of Walt Disney World, your preferred fireworks view is going vary vastly from the next person you talk to or even pass in the parks. So, what's my recommendation? Honestly, I don't have a favorite viewing location. I love the environment of viewing the show from Main Street because there's just a classic element to the experience, but it's not necessarily the best view overall. So, if I had to give a recommendation, I'd say to look through the options above and pick what seems most intriguing to you. If that spot is already full when you're looking for a place in the parks during your trip, try another one on the list. Knowing a variety of options is half the battle when the crowds are heavy and from time to time the area in front of the castle will fill all the way down Main Street. If you run into that situation, you've got a few great options still. Behind the castle is a go to spot (as mentioned), but you can also see a portion of the show right in front of Splash Mountain and even a select portion of the experience from the bridge overlooking Tom Sawyer Island. If you're looking for something a bit more unique, head over to the bridge that leads over to Starlight Cafe or the bridge on the opposite side leading into Liberty Square. It will undoubtedly be a somewhat obstructed view, but still a rather good view nonetheless. No matter what, just catching a glimpse of this show from anywhere in the park is certainly worth taking the time to enjoy for even just a few minutes. Fireworks have a weird way of bringing people together and creating a moment that will exceed your wildest expectations. Along the way, Disney fireworks shows will likely ruin all other fireworks shows for you in the future, but we can't complain too much about that!